Sometimes I bake things that haunt me for the rest of the year. These things are usually the baked treats that score a 5 out of 5 and are eaten all-too-quickly. The recipe of which I adapted this from is one of them; the infamous Sour Cream Buns. I've been meaning to bake them more frequently (read: every day), but I don't think that eating 7 cinnamon buns a day would be very healthy. So, I've managed to wait at least a few months before making them again. And boy, were they good!! 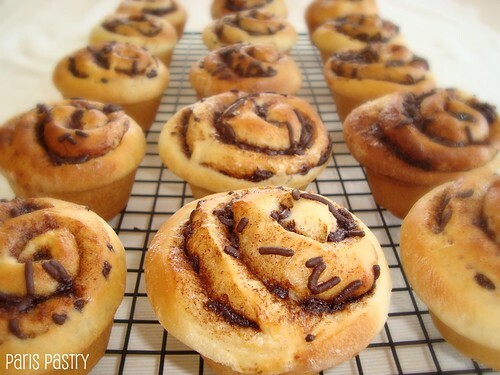 That beautiful texture of the bun paired with a crunchy cinnamon/cocoa filling and CHOCOLATE SPRINKLES!... *sighs*. Rating: of course a 5 out of 5. - In a large bowl, dissolve yeast in warm water. In a small saucepan, combine sour cream, granulated sugar, shortening, and salt. Heat and stir over medium-low heat until warm (120°F) and shortening is almost melted. Stir in baking soda. Stir sour cream mixture and egg into yeast. Stir in as much of the flour as you can. - Turn dough out onto lightly floured surface; knead in enough of the remaining flour to make a moderately soft dough (3 to 5 minutes total). Cover and let rest for 5 minutes. - Grease twelve 2 ½ -inch muffin cups, set aside. On a lightly floured surface, roll dough into an 18 x 12-inch rectangle; spread with softened butter. Combine brown sugar, cinnamon and cocoa powder; sprinkle cinnamon/cocoa mixture evenly over dough. Repeat with the chocolate sprinkles. Roll up, starting from a long side; seal seam. Slice into twelve 1 ½ -inch-wide pieces. Place each bun, cut side down, in a prepared muffin cup. - Cover and let rise in a warm place until ¼ to ½ inch above top of cups (about 45 minutes). Bake in a 400°F (200°C) oven about 15 minutes or until golden brown. Remove buns from pan. - Combine confectioners' sugar with cocoa powder and vanilla, and enough milk to make an icing, of drizzling consistency; drizzle over rolls. Serve warm. Ok, I'm pretty sure that I just gained a few pounds just looking at the picture. Jeebus, these look so delicious! Oh my... do they look good! By the way, thanks for joining our SFGA! omg! these look so good :) giving them a try soon, thanks for sharing. Oh my gosh. I am in Chocolate Bun heaven right now! Oh these look so good - I simply must try! 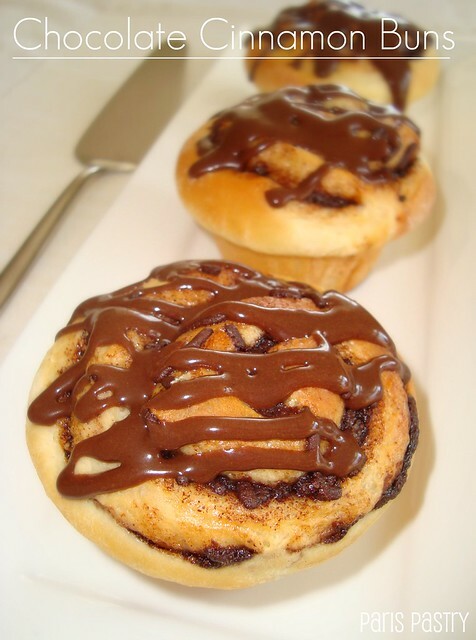 These buns seriously look to die for! Wish I had a couple to chomp on right now.